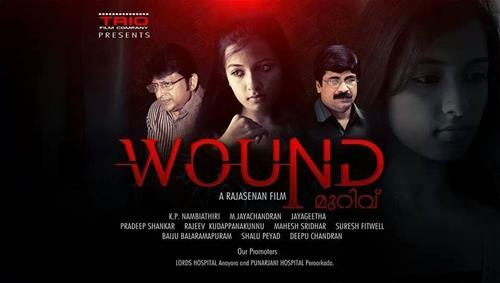 Wound malayalam movie directed by Rajasenan is currently on going shoot at Thiruvanthapuram. Along with Rajasenan, popular actors and new faces will give life to prominent characters in the movie. The movie revolves around the story of Devdas and his family. For the lyrics of M R Jayageetha, the music is set by M Jayachandran. The camera is being wielded by K P Nambiathiri while Pradeep Shankar stays behind as the editor. Rajasenan, better known among the malayalam movie lovers as a film maker with an extra bone is working behind his new project which is truly made for the family audience. After '72 Model' and 'Radio Jockey', Rajesenan is helming his new venture. The movie titled 'Wound' is melodic family drama. Along with Rajasenan, popular actors and new faces will give life to prominent characters in the movie. The movie revolves around the story of Devdas and his family. Devadas is a business man who lives with his wife Sreedevi and 13 year old daughter Meera. During their peaceful life journey, an incident which comes on the path brings distress to the unit. The story takes a new shape as Devadas struggles to cop up with the situation. Creamed with suspense and thrills, the movie will be a complete entertainer. M R Jayageetha, who is better known as an orator and poet will pen lyrics for the songs. The music of the movie will be safe in hands of M Jayachandran. The camera is being wielded by K P Nambiathiri while Pradeep Shankar stays behind as the editor. Kudappanakunnu Rajeev will be the production controller while the art work be safe in the hands of Mahesh Sreedhar. Much is expected from the veteran film maker who had shown his mettle as a film maker for the past 3 decades. The shooting of the movie is currently progressing in Thiruvanthapuram. Suresh Fitwell stays behind as the costume designer supported by Baiju Baiju Balaramapuram as the makeup man. Shalu Peyad handles the photographs of the movie. Rajasenan has also proved his mettle on silver screen giving life to various characters in movies like 'Bharya Onnu Makkal Moonnu' and 'Oru Small Family'. 'Wound' is expected to give ample opportunity for him to show his acting skill too.